I am obsessed with oatmeal. I love almost all breakfast foods and could probably live the happiest life of them all if I was restricted to breakfast for the rest of my life. But oatmeal specifically has a special place in my heart. Bring water to a boil. Add in oats, banana, ground flax seeds, and cinnamon. Reduce heat and allow the oats to cook. Remove the pot from the heat and allow to sit for 1-2 minutes. Add egg whites and stir so that the whites are blended. They should not cook. Return to low heat for 5 minutes. Add maple extract and stevia. Poor in a bowl and enjoy. I usually top mine with some sort of nutter butter and blueberries but you can let your imagination run wild. This usually holds me over for at least 3 hours, which is important because I am a very cranky person when I am hungry and have no access to snacks. Yum!! 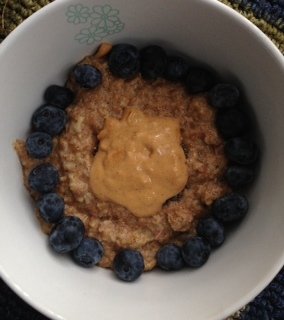 I love oatmeal too, and I’m always looking for new recipes to try! I cannot get enough of oatmeal! It’s so versatile. I’ll be posting many more of my favorite recipes!